Add all ingredients in food processor and blend until smooth. If you don’t have a food processor you can mince the garlic and whisk ingredients in a bowl. Spiralize your zoodles and place them on top of some paper towels in a strainer. Let the zoodles sit as you prep the rest of the veggies so they have time to sweat out some of the excess water. Add olive oil, garlic, peppers, and onion to a frying pan and sauté until soft and browned. Add in carrots and water chestnuts and continue to sauté. Wrap your zoodles tightly in the paper towel and squeeze to pull out as much water as possible. Then add zoodles to frying pan and sauté mixing with other veggies until soft. Drain any excess water and add 3/4 cup of peanut sauce. Turn to medium heat and simmer for 3-5 minutes. Add more sauce if needed. 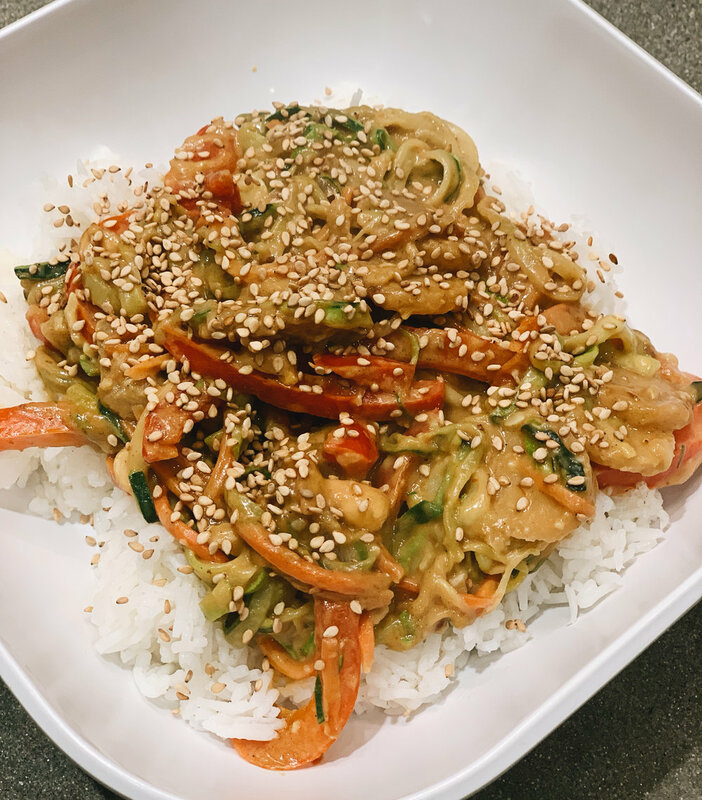 You can eat the zoodles as is or add this wonderful veggie mix on top of some white rice. Top with sesame seeds and enjoy.